I'm putting that number in big red type because YOU KNOW WHAT I'M PRETTY FLIPPING PLEASED ABOUT IT. My family, friends, and friends of friends and family donated more than $12,000 to the Juvenile Diabetes Research Foundation by mid-May 2014, so you met (and zipped past) my fundraising goal within the timeline I'd set. In mid-May 2014 I ran my 11th half-marathon. I did not run the 12th one until October 19, 2014, so I did not do all the races I'd intended to do in within the timeline I'd set. There were a couple of reasons I missed the race goal. One was that I'd started to have problems with my Achilles tendons. After a race I did in March, they were very tender and I didn't feel up to doing another race the following month. I managed to do one in May, but it was painful and I felt like my body was begging me to listen. That combined with the fact that the race schedule is all but bare in this region of the country in June, July and August (because of the heat) and the fact that starting in early June Brandon began traveling for work every week (so I was chasing the kids from 5:30am until 8pm every day without a break, freelancing after that, and averaging around 5 hours of sleep per night ... pretty intense exhaustion, and I didn't have the support system to mind the kids while I did longer training runs) meant I had to release my grip a bit and just ... accept. I was still proud of the fact that I'd done 11 races in 12 months, but I knew I had to do the 12th one before I could crow out loud that I DID IT. But here is why this post has taken me a dreadfully, soul-suckingly, lay-awake-in-bed-at-night-and-feel-like-a-failure long time to write: What was, to me, an important part of my accomplishment has become a ghost. My personal fundraising page -- which shows how much I raised and all the people who donated and all the incredibly, humblingly kind and supportive words they lofted and which was basically my own little cave of joy -- is gone. JDRF changed the host for their online fundraisers, and when they did that they deleted all the existing fundraising pages. They sent out a single email announcing the change 10 days before they enacted it, but the way it was worded I didn't understand that it pertained to me (and in any case the email did not explain what you should do if you had an ongoing -- versus a single-event -- fundraising challenge and wanted to preserve your page). I'm keeping my hands folded in my lap and my face neutral while I share this info. (How is she typing with her hands folded in her lap? What are her toes doing?) It is between me and my ego whether I am going to be dragged down by the fact that I cannot prove to anyone else that I did it. I got the JDRF folks to send me an Excel spreadsheet that shows all my donations and who they came from, but the personal notes are gone and the little essay I'd written about what I was doing and why is gone. When I discovered that my page no longer existed, I was dragged down for sure. Devastated actually. At first it really and truly felt like my accomplishment had been taken away from me, like all the work I'd put into this idea and the ring of people who I felt were holding my hands and cheering me on (AND, most importantly, showing me that they too think the world would be a better place without Type 1 diabetes) had been detonated. I didn't sleep that night. My chest was a hot tangled mess of sadness and fury. But I have taken some deep breaths and regained my composure. I am hoping that all you heart-swellingly, mind-bogglingly generous people who donated to my fundraiser know how important this effort was to me and how much your show of support made me feel like a huge balloon full of sweet air bobbing around over the treetops. There is not an absolutely logical connection between your donations and my conviction that this disease will someday become extinct, but somehow one deepened the other. Every day, hopefully each of us does at least one or two nice things that we maybe don't ponder too much (holding a door, smiling at a stranger, picking up something they've dropped) and we don't necessarily ever know whether the gesture created a ripple. I don't know how much time any of you put into deciding whether to donate when I asked, but you made very big ripples, lots of them, and they gave me that light, bobbing feeling again and again for a whole year. If I could walk without limping right now, I'd probably be entertaining the idea of doing the whole thing all over again. I look vaguely like I'm trying to scare someone - ? 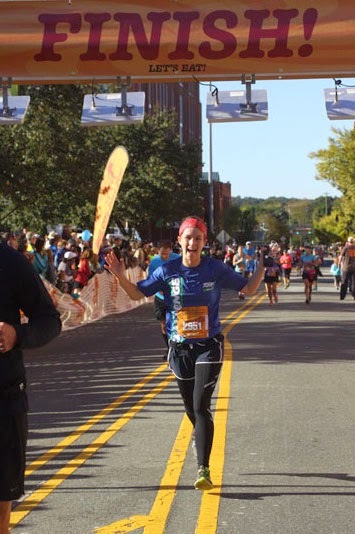 A few words about my final race: It completely chewed me up and spat me out. It is the only one in which I ever slowed down. Both of my Achilles (or the muscles surrounding them) cramped up repeatedly, and at 12.5 miles my left one seized so badly I couldn't even move myself out of the way of the other no doubt irritated runners. I was frozen, doubled over, clutching my leg and feeling frantic when a hero cop came over, helped me to the curb, and stretched me for several minutes. I managed to run (it may have been a bit of a mincing stride) the final .6 mile, crossed the finish, and was shocked to see that my time was still decent by my standards. If not for the stop, this would have been a personal best by at least a couple minutes. I had had this idea that for my 12th race I wanted an "I DID IT!" photo as I finished ... and what you see here is what I got. It slays me. I am such. such. such a dork. I wanted to look cute and joyful. I look awkward and ... just sort of weird. The Real Me simply will not be subdued. So I am closing this little chapter. It was such an exciting and rewarding one for me, and joyous in that I owe any feelings of success to the support of other people, some of whom are within my tighter rings of community and some of whom came from further away. I know I and all those people have helped nudge science a little closer to a cure and prevention for Type 1 diabetes. You look joyful. Take care of those tendons...great job! Alison I am inspired by your inspiration and determination! Awesome job! Hi Allison...Linda Hull a long time friend of ours posted part of your blog on FB for us to see. In Januaryof 2014 we lost our 36 year old son to diabetes. However the issue was more that the pharmacy turned him away because his script was out and they told him to contact his doctor. He died before that happened. Anyway my wife and I have investigated alot about diabetes since then. Since May we have raised $20,000 for Diabetes Partnership of Cleveland to support their emergency insulin program. Some how maybe we can combine efforts and make significant changes. There are many issues surrounding type 1 besides the diabetes itself. One being education of type 1 itself and the difference between 1 and 2. Lots too say but maybe your blog isn't the place. Congrats and thank you for all you have done!! Alison: wonderful chronicle of an incredible journey--as usual! I miss your writing! Is there a way people can still contribute to support your impressive effort? Can you create a new donation page? I'd like to post this but would also love a way for people to lend support for this important cause. Thanks. Alison, you DO look cute and joyful - I wish you could see yourself as the rest of us do - those of us who would have REJECTED the idea of running 12 marathons for even a good cause! Congrats.